Produced in association with Dreamcatcher Entertainment’s Fulfill Your Dream program and directed by Patrick Marran, King Arthur In Contemporary Connecticut will be staged as a live audio drama (think: It’s a Wonderful Life: A Live Radio Play, The Thrilling Adventure Hour or The Hitchhiker’s Guide To The Galaxy Radio Show Live), using both pre-recorded sound effects and music as well as performing some sounds effects live in stage. You can listen to a teaser trailer HERE. Tickets are on sale now and you can get them HERE. For the 2 PM show on Halloween (10/31) ONLY, come in costume and you can get a discounted ticket for only $ 10.00. Come in some sort of Arthurian-themed costume and you can get a discounted ticket for only $ 5.00. King Arthur In Contemporary Connecticut also now his its own Facebook page. If that’s your thing, you can like us HERE. Inspired (loosely) by Mark Twain’s classic novel A Connecticut Yankee in King Arthur’s Court, King Arthur In Contemporary Connecticut reverses Twain’s original premise, following the exploits of King Arthur after he is unexpectedly transported to a small town in twentieth century Connecticut, where the once and future king struggles to adjust to his new future even as his past refuses to stay in the past. 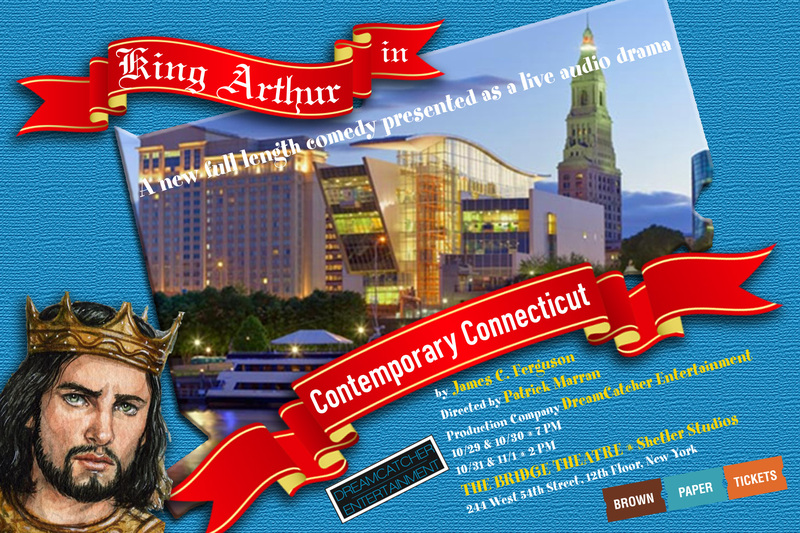 This entry was posted in KAICC, New York, Plays, Theatre and tagged audio drama, audiodrama, Comedy, History, Humor, King Arthur, live, Mark Twain, New York, New York Theatre, nyc, radio play, Theatre, things to do. Bookmark the permalink.